Do you currently like us on Facebook? Do you follow us on Twitter? Are you a Snapchatter? 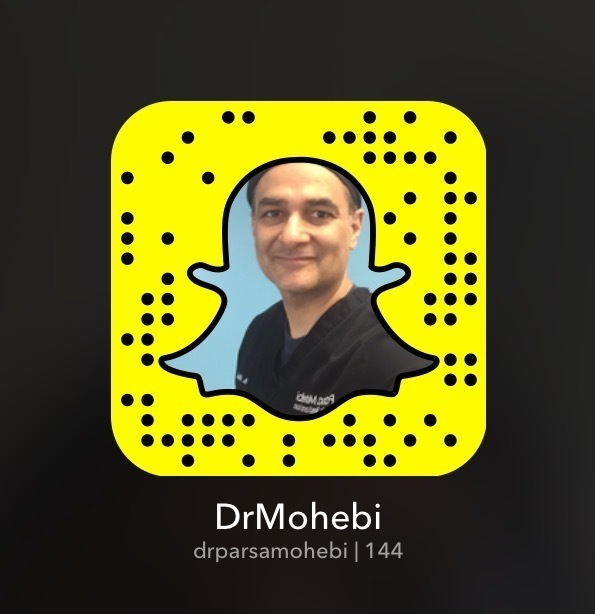 If so, join Dr. Mohebi on Snapchat @drparsamohebi. Not familiar with Snapchat? It’s a mobile app that lets users upload pictures and videos that disappear within a 24 hours of a person uploading them. Dr. Mohebi will be sharing behind the scenes photos, videos of our office, live videos of hair transplant procedures and exclusive content directly on his Snapchat account. If you don’t have Snapchat on your phone yet, you can download the app for free. Just search for the user name “@drparsamohebi” on the Snapchat app. If you already have Snapchat, just hold your phone up to the Snapchat ghost on our website and you’ll automatically be following us. Visit our event page to see a list of our upcoming hair transplant Snapchat stories. For those who don’t have Snapchat, we are constantly updating our video page so patients can find some of our previous hair transplant Snapchat about different procedures.